Omiyage, お土産 is the Japanese word for souvenirs. Japan is a country where souvenir giving is important. Hence, there are lots of options for souvenirs when you travel to Japan. A friend of mine is working on a project at the moment in Japan. When I first heard that she was going to be working on a project in Japan, my first reaction was - "Whoopee, I now have a stable source for my favourite omiyage, Yoku Moku". It's a company that sells butter cookies from Japan.. You can find them in the food level of most major departmental stores in Japan. 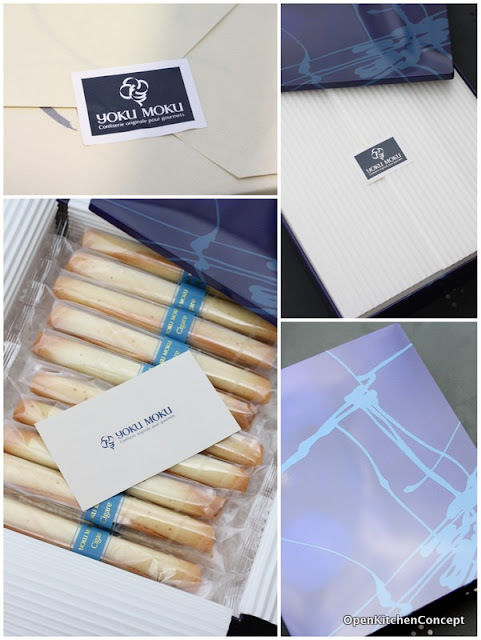 Yoku Moku is famous for their "cigare" - These are delicate rolled cookies with a light butter-vanilla taste. Like most Japanese souvenirs, they come beautifully packaged. Each cookie is individually wrapped and come in a beautiful box. I've been eating them since I was 18 and I've kept all the boxes I've bought.. The basic cigare always come in a blue box, although the shape and size of the box have changed over the years. The "cigare" also comes in other flavours like chocolate and coffee.. They are all great, but I like the plain vanilla version best. They are my favourite omiyage from Japan. Whenever I travel to Japan myself and have to think of a gift for friends or colleagues, I'd end up buying these. Whenever I have good friends going to Japan, I'd ask for a box of these as well. I got a box of these in September and they served me well during my confinement. I'd treat myself to one whenever I got stressed out. Needless to say, they ran out pretty quickly!